Guest contributor Jonathan Stevenson / Art forgery seems especially unsporting and misanthropic as non-violent crimes go, involving as it does the subversion of high culture. For one unknown artist to represent as his own a painting made by another artist would seem a less objectionable transgression than copying a master’s work. But in the circumstances chronicled in two recent movies, Big Eyes and Art and Craft, the reverse is true. 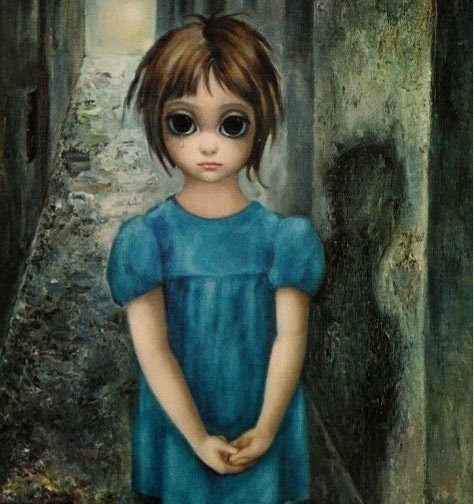 A Margaret Keane painting of a girl with big eyes featured in the film. In Tim Burton’s Big Eyes, based on true events that occurred mainly in late 1950s and early 1960s San Francisco, a talentless, bullying husband with artistic pretensions and a certain oleaginous charm makes a fortune by claiming as his work the big-eyed caricatures of little girls painted by his biddable, proto-feminist wife. Christoph Waltz (who was so good in Inglourious Basterds and Django Unchained) egregiously overplays the husband as a cartoonish pig, which makes it harder to take the movie seriously, but Amy Adams saves the enterprise with an earnest and convincing performance as the real painter, Margaret Keane. The contrast in tone between the two performances does point out the gap between outsiders’ perceptions of what rank-and-file artists are like and how artists actually behave. The film also freshly and sharply raises the familiar question of whether critics or the masses determine what “art” is, which has no simple answer – even with respect to what has come to be seen as Keane’s Hallmark-esque kitsch. If Big Eyes is not Burton’s best (call it Hitchcock lite), the documentary Art and Craft is seamlessly artful and quietly accomplished (call this one Hitchcock happy). It concerns Mark Landis, a frail and guilelessly charming schizophrenic with an uncanny talent for forging artworks by the likes of Daumier, Signac, Watteau, and Charles Courtney Curran, as well as noted but less celebrated artists such as Marie Laurencin, Stanislas Lepine, and Louis Valtat. 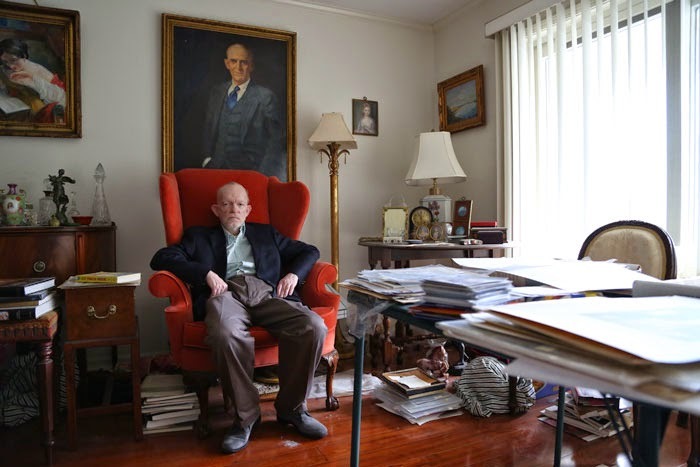 Without compensation, Landis palmed dozens of his forgeries off as originals mainly to small regional museums in the United States. The film intelligently explores what constitutes art, chronicles how one mischievous oddball copes with what is to him a scary world, noodles edifyingly on the notion of life as performance, and touches on the infiltration of film itself into the psyche – Landis works while watching old movies and TV shows and quotes freely from them – all along an elegant and endearing narrative arc. As Landis gradually takes shape as a misfit hero, Matthew Leininger, the dogged former Oklahoma City Museum of Art registrar who uncovers the serial deceptions, emerges as a curmudgeonly, humorless spoilsport. The film culminates in the opening of an exhibition of Landis’s work at the Dorothy W. and C. Lawson Reed Jr. Gallery at the University of Cincinnati. Titled “Faux Real” and organized by both Leininger and Aaron Cowan, the gallery’s rather more open-minded and playful director, the show asks whether forgery can be art. But if Leininger had hoped to discredit Landis, he was disappointed. Instead he witnessed an enthralled if somewhat bemused reception – Landis’s improbably triumphant day in the sun. Certainly Art and Craft makes a strong conceptual case that an oeuvre of forgery – at least if it’s enshrined as the “philanthropy” of an eccentric imp – might be art, and that contemporary art is indeed a large and expanding nation. After Art and Craft opened at the Angelika in September, Think Coffee on Mercer Street was offering his forgery of the Mona Lisa – as such, signed by Landis – for 25 grand (proceeds to go to one of the museums he fooled). During the run-up to the release of Big Eyes, prices for Keane’s paintings soared. But I’d rather own a Landis.